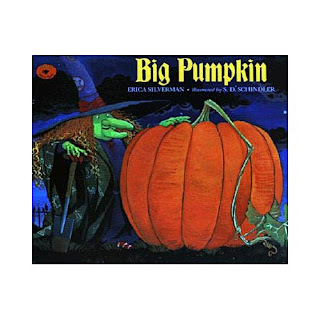 Story Time With the Library Lady: "The Big Pumpkin", Or, Believe It Or Not, A Real "Flannel Friday"
"The Big Pumpkin", Or, Believe It Or Not, A Real "Flannel Friday"
As I've said, I rarely use flannelboard stories of the sort most "Flannel Friday" folks do. Occasionally I use magnetboards, a slight variation where the pieces are usually made from paper covered in clear contact paper, with magnets on the back, but even those are not much in my repetoire anymore. I was talking about this with our circulation manager(who recalled using flannels less than successfully in Bible classes long ago) and realized that what a flannelboard is, at least to me, is a bridge to storytelling rather than reading the book out loud. It offers a visual, a way to tell the story and yet still put pictures in front of your audience. Every Halloween for "The Big Pumpkin" I use wonderful flannelboard pieces (which have magnets on the back, BTW) that were made for me long ago by a skilled assistant. They're fantastic, as you will see. But it's not just her art that brings the story to the children. It's me, telling the story. Using silly voices--love doing the Vampire to sound much like "The Count" on Sesame Street. Having the children "pull and tug" along with me--was amused to realize that I automatically stand in ballet 4th position to brace my feet for this--and chorus along with "and the pumpkin just sat!" It's the storyteller that makes a story special, whether you do it with fancy props, a magnet board, a book, or simply in what came be the most powerful medium of all, your own voice. So take joy in this, and every story you tell, no matter how you tell it! This is one of my all-time favorite Halloween books! I have it set aside to read to my preschoolers tomorrow. And I couldn't agree more with this statement: "It's the storyteller that makes a story special, whether you do it with fancy props, a magnet board, a book, or simply in what came be the most powerful medium of all, your own voice." I have been relying very heavily on props lately, because I felt that was what made my story times special, but then I did one story time with just me and the books, and realized that can be just as special. The thing is that the majority of the kids I work with are 2s and they need a bit of "bells and whistles" in a group. For that matter their parents/nannies need that too! And when I do a magnetboard or prop telling I always make sure to show the book when I have it. Sometimes, as with "The Ghost's Dinner", I don't. Which is one of the main reasons for these prop stories and magnetboards!